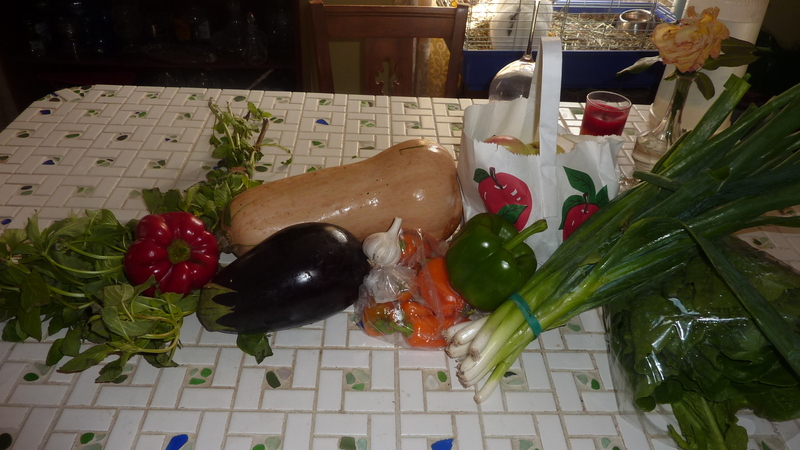 In this week’s share, we received a big bundle of basil, a red pepper, an eggplant, a butternut squash, a head of garlic, a bunch of Yummy orange peppers, a green bell pepper, about a dozen apples, some scallions, and lettuce. We don’t have too many leftovers for last week, despite my pathetically sparse posting this week. We have some lettuce, the kohlrabi, sweet potatoes, and an onion or two. Luckily, kohlrabi, sweet potato, and onions all have a relatively long shelf life. Those kale and ricotta ravioli in a white wine basil sauce I talked about turned out not so great … I just could not get the pasta dough to cooperate so I ended up with only a few ravioli. I would hate to post a recipe with sub par results, so despite the fact that the filling and the sauce were really yummy, I won’t be posting the recipe. One evening, I made a soup very similar to this mushroom and silken tofu in dashi-miso broth which was absolutely delicious but didn’t justify a post of its own due to its similarity. I used two week’s worth of apples to make homemade apple pectin, which will come in handy in making jams and jellies. I had debated even posting the recipe since it’s so simple (quarter apples, cover with water, boil for a long time, basically), but it’s certainly worth knowing how to do. I have a head cold from hell at the moment, so I want to make a soup. One of my readers suggested a puréed kohlrabi soup, so I might try that using kohlrabi and onions from last week and garlic from this week. I will probably make some apple butter with the apples, since I absolutely love it and its super easy. I’ve been craving a charred green pepper sandwich, so that’s in the cards for one day this week. My initial plan for the orange peppers is to stuff them with ricotta and then do a spin off of a chile relleno. 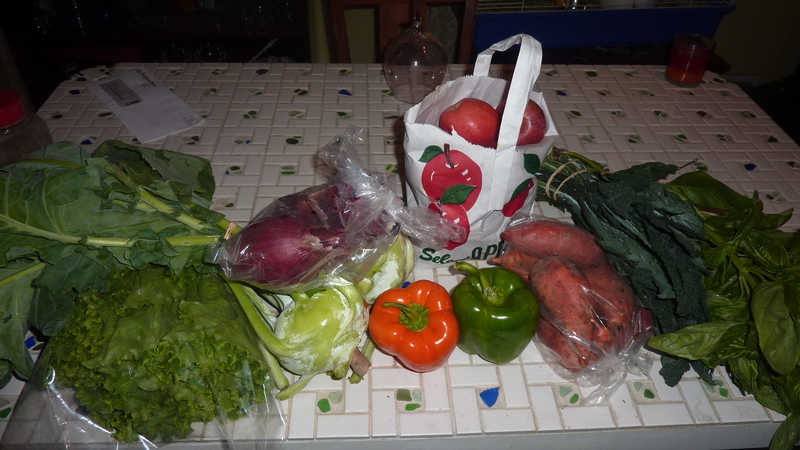 In this week’s share, we received a head of lettuce, two large kohlrabi with greens attached, several red onions, an orange bell pepper, a green bell pepper, over a dozen apples, over half a dozen sweet potatoes, a bunch of lacinato kale, and a large bunch of basil. Our leftovers are fairly minimal. I threw out a few odds and ends of lettuce that were looking pretty grim and some of the bok choy. I have a patty pan and yellow squash still hanging about, as well a bunch of green beans and a tomato or two. I ate a few apples, but intentionally saved the rest hoping to get more so I could make some homemade pectin. Luckily, that gamble paid off. I roasted off both of the eggplant to make some baba ghanouj, which I intended to do as soon as Zak clears out of the kitchen (he’s currently bottling some beer). The artichoke heart stuffed peppers used some Red Carmen peppers from a few weeks back. The clam and corn soup with kale and barley used both reserved corn cobs and kale. I have a few concrete ideas for this week’s produce. One of those kohlrabi is getting sliced up to dip in the aforementioned baba ghanouj. Tonight, I am making kale and ricotta semolina ravioli in a white wine and basil sauce. To say the least, that will knock off most of the kale and basil. With any remaining kale and the kohlrabi greens, I plan to make a warm salad wilted in olive oil and fat reserved from my garlic parmesan duck wings, topped with some rye bread crumbs – probably alongside a baked sweet potato. As I said, I’ll be making some homemade pectin with the apples. I’m a day late in sharing the produce we received from our CSA this week, but that doesn’t mean I’m any less excited about what our share included. 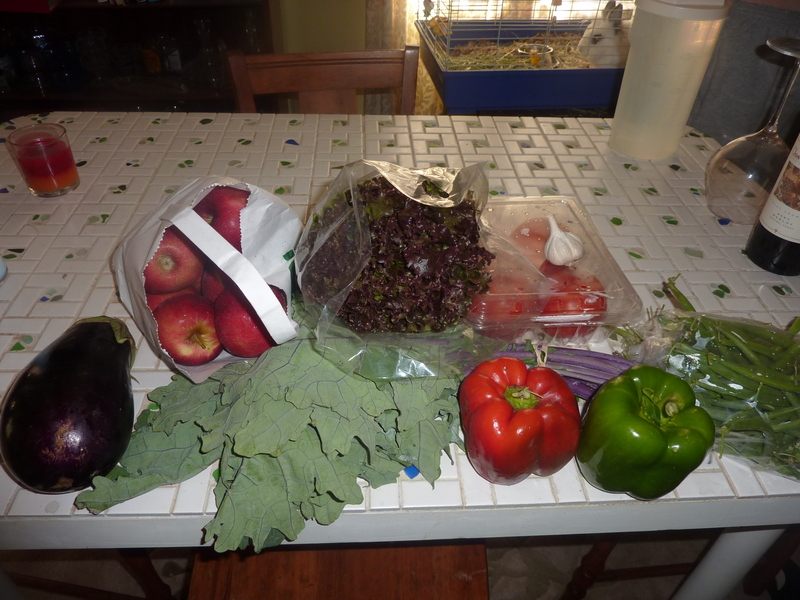 In this week’s share, we received an eggplant, plenty of apples, a bunch of kale, a head of lettuce, four tomatoes, a head of garlic, a red bell pepper, a green bell pepper, and a bag of green beans. I’m a little disappointed in our use of the produce from last week. I attempted to make a corn salad on Wednesday, and the corn was no longer looking very good. Boo! I added them to the stock bag, but it was a disappointment. The red bell pepper similarly went bad, and the long red peppers, some bok choy, and some lettuce are still knocking about. Both the squash and the eggplant are still around, too. Basically, we stunk at using produce. I did use all the green beans we had making crispy roasted green beans to go with my garlic parmesan duck wings. I am definitely going to make some baba ghanouj with the eggplant from both this and last week. My parents had a clam bake yesterday and we have a canning jar of some broth to use, so I’m going to make a bok choy soup. I want to sauté the kale and toss it with pasta in a red pepper pesto. I’ll eat a few apples out of hand, and the rest will get used to make some homemade pectin. This week’s share has an awesome amount of variety, for which I am very excited. 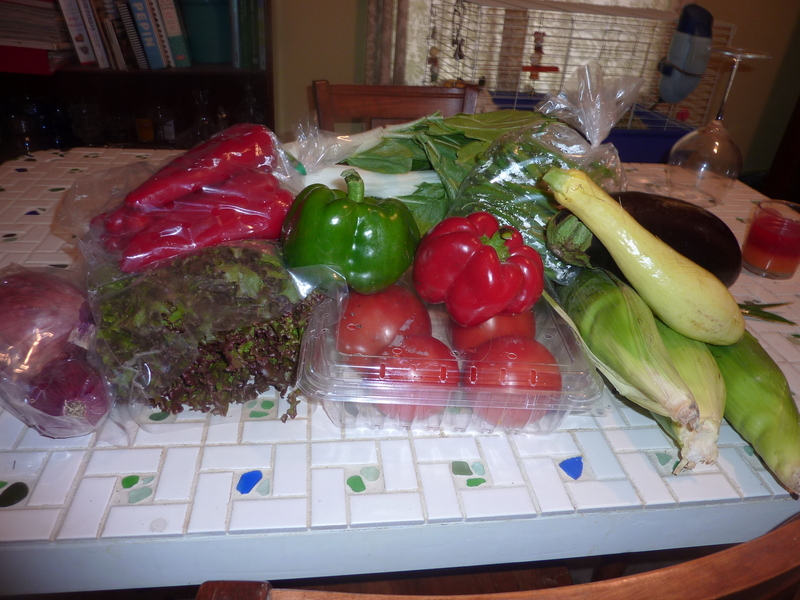 It includes, two red onions, half a dozen long red sweet peppers, a head of lettuce, the most ginormously huge bok choy I’ve ever seen in my life, a green pepper, a red pepper, three tomatoes, a bag of green beans, a yellow squash, an eggplant, and three ears of corn. I also ordered a dozen eggs as an extra, which are not pictured. 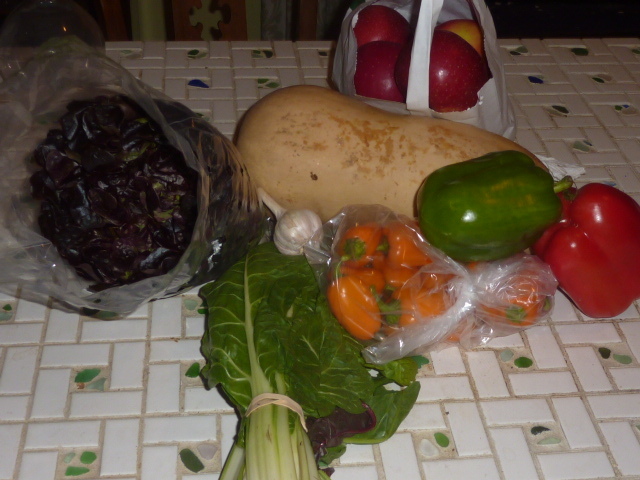 Leftover from last week are the beets, a bit of lettuce, a few of the cherry tomatoes, and the patty pan. The rhubarb vinaigrette I posted used rhubarb from week seven. The loaded alfalfa sprout panini with rhubarb vinaigrette used CSA tomatoes and peppers, leftover from the vegetarian burrito bowl I posted a few weeks back. Finally, the eggs and greens on pancetta roasted naan used a bunch of CSA lettuce. Zak made an Asian rice dish with a lot of other CSA ingredients. Now that the weather has cooled down – I don’t think I’ve ever been so excited for sixty degree temperatures in my life, and absolutely cannot wait for fall to begin for real this year – I will definitely making the crispy roasted green beans I’ve been talking about for so long. Zak bought me some duck wings to experiment with at the Asian market, so I think I’m going to pair those with some roasted beets and crispy roasted green beans. I want to make a light corn and tomato soup with some of the corn (I also have plenty of cobs leftover in the freezer from previous weeks to make a hearty corn broth). Tonight, Zak is making a huge pot of chicken-based Vietnamese pho (I’ve posted both vegetarian and beef broth versions before) in which we’ll use up some of that gorgeous bok choy.